Just a month before the Samsung held its annual Unpacked event in San Francisco, an alleged Galaxy S10+ was spotted in a position of one Samsung Employee. And it’s nothing we’ve ever seen before. We’ve been hearing news about Samsung Galaxy S10 since last year, following Samsung’s annual developer’s conference in November. During the event, the company showcased its all-new punch-hole camera solution, hence sparking rumors of the possible design for the Galaxy S10. Furthermore, before the event, in October, Samsung announced the Samsung Galaxy A9. The world’s first phone with four cameras on its rear. This leads fans to even more speculate the potential specification of the yet unannounced handset. Now, a leaked photo reveals some secrets of the device. Looking at the photo, we can see that the device features a true full bezel-less display. We can also somehow see some slight curves on the side of the display. A trademark of all the high-end Galaxy S devices. But the most interesting thing is the placement of the selfie camera. Instead of a notch, or the single circular punch-hole design we’ve seen, this one looks more like an oblong. This is because, as per info, the device will have a dual selfie-camera. 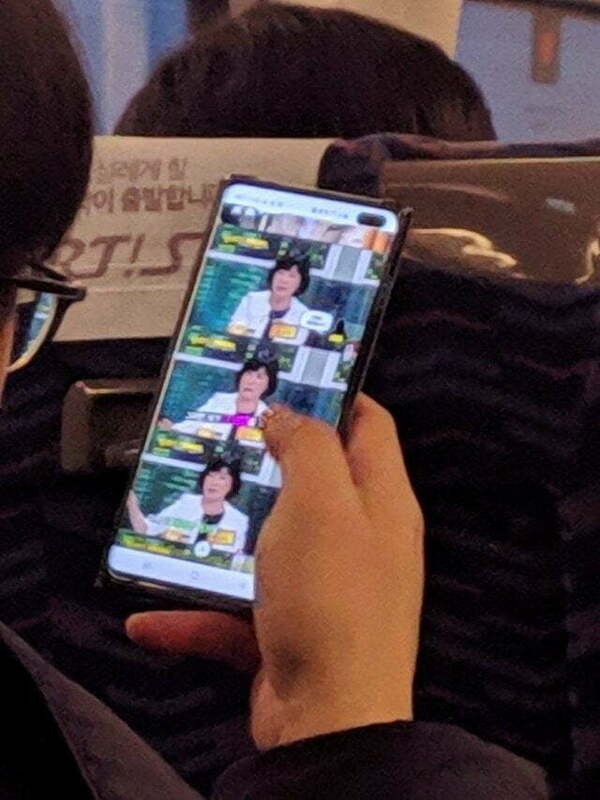 The man behind the leaked photo confirmed that this is indeed the elusive Galaxy S10+. According to the leaker, the Galaxy S10+ shown came with a flip cover. However, instead of a watermark, the screen has the employee ID and the device’s SN. It was likely taken from a bus from/to the Suwon Campus where Samsung Electronics’ key facilities are located. The device also has a pre-production case to conceal the design away from the sneaky eyes. The Samsung Galaxy S10+ will be one of the first smartphones to use the latest Qualcomm Snapdragon 855. Aside from the whole new design, it will also feature an in-display fingerprint sensor and four rear-facing cameras. However, due to the different approach to an in-display fingerprint sensor, there has been a rumor circulating that the biometric will not work with any screen protectors. This is such a huge dealbreaker for consumers because the new design makes the phone looks more fragile than ever before. Hopefully, the rumor isn’t true. Next articleNokia X7 gets stable Android Pie update!